Puerto Morelos Blog: Attention Puerto Morelos Homeowners: Join us for the Selling Webinar on Tuesday! 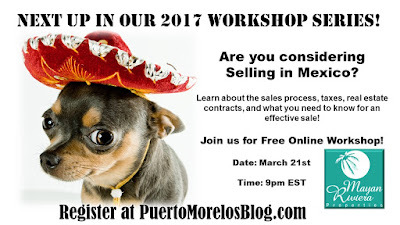 Attention Puerto Morelos Homeowners: Join us for the Selling Webinar on Tuesday! Attention Puerto Morelos Homeowners (or any Mexican Home Owner)!!! We have a webinar coming up on Tuesday that walks you through the paperwork required for a sale, how the capital gains tax works, what to expect from Realtors, and all of those questions you'll have should you ever decide to sell your property.